"Having written a 500+ page (8 1/2 x 11) history of the small village of about 150 people where I grew up, I contacted several print-on-demand companies on-line. BooksOnDemand.com was the only one which would do my 500 pages in one volume. They helped me combine the different parts so that the pagination was separate for each part. The cost was very reasonable. I ordered 25 at a time, questioning whether they would sell well. Within six months, I had sold 100 copies. I was very pleased with the quality of the printing and binding. When I re-ordered, I received my copies within a week. I would recommend them to anyone...."
The Printing House has built a national reputation as the printing partner for conference organizers. We have a 30-year track record of producing quality print and digital materials for organizations. With The Printing House you can be sure of the professional look and feel you want, with excellent pricing and guaranteed on-time delivery to anywhere in the world. Why paper materials? Bound paper provides conference-goers with a tangible product, made to last. We keep things "green" by using environmentally friendly solutions: our paper is from sustainable sources and is biodegradable. Bound conference materials are cost-effective--you get the number of copies you need, along with future on-demand printing capability. Of course we can coordinate your conference's print materials with digital media, a growing expectation of today's culture, all within our shop. Our account executive will work with you to consider the paper and digital solutions that best fit your conference audience and your organization's brand. The Printing House can help you choose from a variety of paper for text and covers. 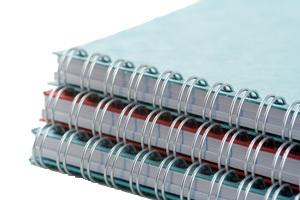 Binding styles include "Perfect Binding," "Durabinding®" for books with high page-counts, as well as plastic coil, double loop wire, saddle-stitch, and three-hole punched with tabs. You can work with an expert account executive, who will guide you and your project through every phase of production. They will help finalize your project specifications and provide ideas and expertise as needed. Throughout the process-- from upload of content to shipping the final printed publications-- your account executive will be available by phone and e-mail if you have any questions or changes. The Printing House can offer concierge service for complete project management-- from coordinating with a website provider for the collection of papers, to providing printed proceedings for your members. Putting together a conference doesn't need to be daunting for your organization. Let us handle any or every aspect of the printing projects for professional results.